Hyperbaric Oxygen therapy involves the medicated treatment wherein a patient breathes 100% pure oxygen at a higher atmospheric pressure. The therapy takes place within an enclosed chamber called hyperbaric chambers. Hyperbaric chambers can be mono-place or multi-place. While mono-place chambers are designed to accommodate a single person, eight to ten people can settle in the multi-place chambers and undergo the therapy together. 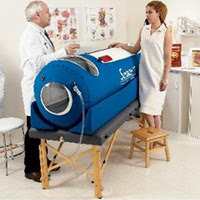 Generally, hyperbaric oxygen therapy takes place under the vigilance of the doctors or qualified medical experts, but, nowadays, people also tend to rent or buy personal hyperbaric chambers to carry out the treatment at the comfort of the patient’s home. Hyperbaric treatment has been in use since the 1600s, but it was in 1800s that its clinical usage was recognized. But it was in the 1950’s when a number of clinical trials unfurled the advantages of the hyperbaric oxygen therapy. Today, hyperbaric therapy has evolved to improve several health conditions such as air or gas embolism, radiation injuries, carbon mono oxide poisoning, decompression sickness. Studies have revealed that this specialized therapy has shown several improvements in treating autism and cerebral palsy. Hyperbaric chambers have become quite common in health spas and gymnasiums and the mountaineers often carry these Gamo Mountain Bags, a type of Portable hyperbaric chamber, in all mountain trekking expeditions. One of the major benefits of hyperbaric oxygen therapy is that the patients need not be admitted in the in hospitals to undertake the treatment. The HBOT treatment sessions and durations are usually scheduled by the medical professionals and doctors and the patients are released immediately after the therapy session is completed. Hyperbaric oxygen therapy does not end with a session or two. For instance, HBOT for autism takes nearly forty sessions for effective treatment. The sessions are costlier than other traditional medical treatments. So, before leaping in for hyperbaric treatment, it is smart to assess the financial potency. Hyperbaric treatment is not suited for everyone. For instance, the therapy is not suited for pregnant women. People with pacemaker or with a heart or lungs disease should not undergo hyperbaric treatment. Patient undertaking chemotherapy drugs are also not fit to undergo hyperbaric treatment. The best way to undergo a hyperbaric oxygen therapy is in a hospital or at a centre that has a team of trained medical experts. Unregulated HBOT sessions can pose problems for the patients and thus, it is best to find reputable clinics to derive the best benefit from the treatment. Discover evidence-based, practical, useful information for anyone involved in HBOT from Physiology and Medicine of Hyperbaric Oxygen Therapy by Tom S. Neuman. An essential tool for anyone who cares for patients with difficult-to-heal wounds, wounds from radiation therapy, carbon monoxide poisoning, and more! Saday Kumar is an Internet marketing expert and technical writer. He has authored quality content for various websites, ranging from sites that provide services like Web Development, Web Design, Internet Marketing, Health, Industrial Equipments, Finance and many more.